On Sunday morning I headed to the marshes of Qigu, which lie close to the coast to the north-west of Tainan, about an hour and a half’s drive away from my home in Kaohsiung. The area is a sprawling mess of fish-farms, wet and dried-out ponds, riverside farmland, and some remaining protected marshes which form the core of the rare Black-faced Spoonbill’s wintering grounds. My first port of call on arrival was the Black-faced Spoonbill visitor center, where telescopes are usually trained on the rather distant spoonbills. The area holds several thousand Black-faced Spoonbills in winter – the majority of the world’s population – but today there were only about 15 individuals visible from the center, roosting far away on the mudflats. An excellent way to view this large, flat area – and see plenty of birds – is by bicycle. However, it’s a bit far to cycle here from Kaohsiung, so today I drove my motorcycle around the perimeter of the large lagoon visible from the Black-faced Spoonbill center. It was gratifying to see plenty of shorebirds enjoying the favorable feeding conditions on the reserve, with thirteen wader species seen on or around the big lagoon, but if I’d had a telescope I would surely have seen a lot more; through binoculars, the majority of the more distant wader flocks had to remain mostly unidentified. Continuing south along the western shore of the marsh, the road eventually turns inland again and follows the north bank of the Tsengwen River. A service road along the top of the flood wall allows for easy viewing of the rather degraded farmland and ponds alongside the river. Much of the habitat along here has been altered or destroyed by earthmoving equipment, no doubt to the great detriment of the birds. I did however see a few of the expected open-country species along here, including Oriental Skylark, Long-tailed Shrike, Richard’s Pipit, and Grey-throated Martin. Returning to regional road 173, I headed east to Madou, then continued east on the 171. A fork in the road is clearly signposted to the Pheasant-tailed Jacana center; turn left here and continue to the center which is on the right after about 1km. As it turned out, I didn’t have to drive more than 50 yards from the intersection before I saw a group of perhaps 10 Pheasant-tailed Jacanas in a wet field close to the road. 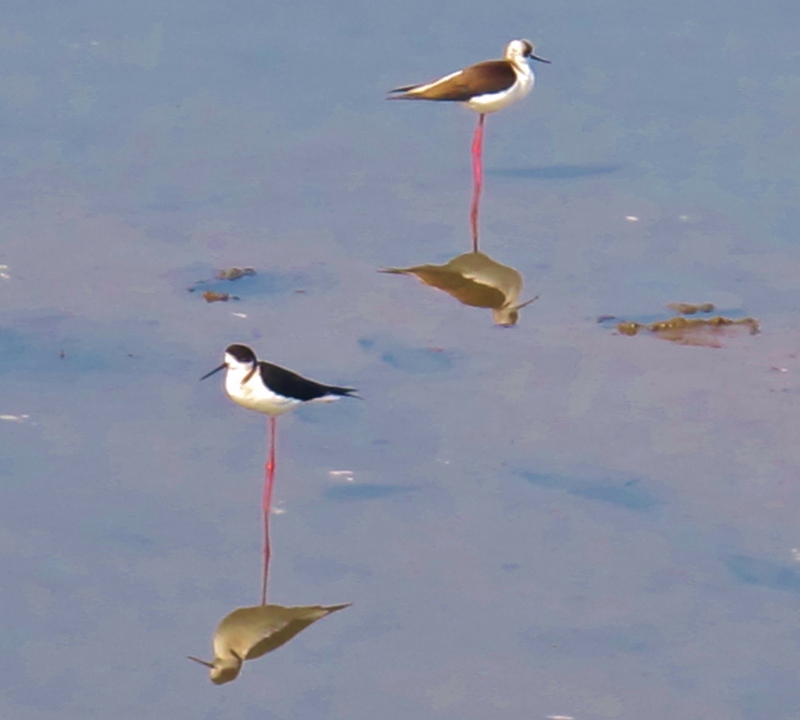 They are still rare birds in Taiwan but seem to be doing quite well at this location, thanks to conservation efforts. The conservation area itself is surprisingly small, consisting of a short loop trail with several hides and viewing blinds overlooking shallow ponds covered in floating vegetation. It’s a pleasant place to while away an hour or two, and I saw a few nice birds here including an Emerald Dove on the path, a drake Garganey, a Chinese Pond Heron, good numbers of Wood Sandpiper, Common Snipe and Common Teal, and of course more Pheasant-tailed Jacanas. The ponds potentially hold Greater Painted Snipe, as well as wintering Pin-tailed and possibly Swinhoe’s Snipe, but without a telescope I just couldn’t see enough detail on the snipes to realistically try and separate them. But the general size and structure of the birds I saw pointed to most, if not all, of them being Common Snipe. So all in all, a good day’s birding, but the moral of the story is that I really need a telescope to get the best from wetland sites like these. Now I have to decide whether to buy a new scope here, or have my old one sent over from the UK …..